Lashes are big, in most cases it would seem the bigger the better! I have taught many lash lift and lash extension courses over the years, false lashes are a huge part of the beauty business and are no longer a special event treat, they are an everyday beauty treatment, like brushing your teeth. They look great, the strip lashes are perfect for an event and for longer lasting lash treatments there are individual lash extensions. However there is a down side to the extensions. Firstly you have to use different products to remove your make up and cleanse with, secondly they require regular maintenance, infills and if you lose some, you have to wait for an appointment and walk around with gaps. Thirdly they are not so good for your natural lashes in the long run. But they look so good!! The solution to this problem with fiddly fakes is a Lash Lift. This a treatment carried out on your natural lashes which makes them look longer, thicker and gives them a great curl which lifts and opens the eyes. It can take a few years off a mature face and adds fluttery girlishness to lashes without the faff. There is no complicated aftercare, no maintenance, no infills, no special cleansing. You do exactly what you did before you had your lift. Basically it a gentle treatment that curls the lashes using a perming process, which holds them in shape for around 8 weeks. It can even correct wonky corner lashes. Your natural lashes are unharmed and continue to grow strong and healthy. A tint is also applied to make them look longer and thicker, quite often clients don’t need to wear mascara after a Lift. It’s great for swimmers and sports players, beaches and holidays because your lashes look great from the moment you wake up. A patch test is always necessary and your therapist should go through quite a thorough consultation process with you to determine whether you can safely have a treatment or not, but if you haven’t tried it yet and you hate fiddly beauty regimes, this could be the lash treatment for you. 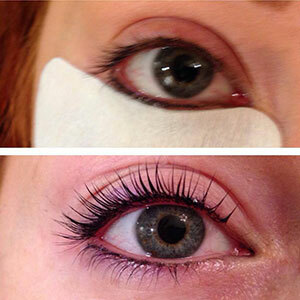 Lash lift treatments and Training are available at The Retreat. For training no previous experience is necessary and many students train to start a small business from home as it’s a great mini business with low costs to start up. For more details feel free to contact Victoria via the website.